Purchase signed copies and support a great cause! You can now order autographed copies of all my books at the Deaf Camps, Inc. Online Bookstore – and all proceeds go toward scholarships for Deaf campers! Nita and her family are back in an all-new adventure that teaches 10 basic American Sign Language signs for babies and their grownups to use throughout the day: wake up, change, clothes, eat, potty, go, play, bath, book, and bed. A simple story about Nita and her parents teaches each sign in context, and repetition throughout each story makes them easy to practice. Even better, each page slides open to reveal accurate instructions on how to make each sign, plus tabs on the side of each page make it simple to locate every sign for later reference. No signing book collection is complete without Nita! Learn more and preorder! See the book trailer and order here. Soraya Gamo was meant to be queen of Qilara until an Arnath slave rebellion destroyed the monarchy. Now, improbably, she sits on the new Ruling Council beside her former enemies, holding the political power she always wanted – but over a nation in ruins. Can Soraya, raised to be a proper Qilarite lady, learn to be a true leader? Or will the sins of her past forever haunt the footsteps of her future? Find out more and order. In a sweeping fantasy that award-winning author Franny Billingsley calls “fascinating and unique,” debut author Kathy MacMillan weaves palace intrigue and epic world-building to craft a tale for fans of Rae Carson and Megan Whalen Turner. Raisa, enslaved in Qilara since the age of six, gets the extraordinary chance to learn the forbidden language of the gods. As she uncovers its connection to her own past, she finds herself torn between helping her people and protecting the man she loves. Find out more and order. Nita knows just how to tell Mommy and Daddy what she needs. All she has to do is use her signs! 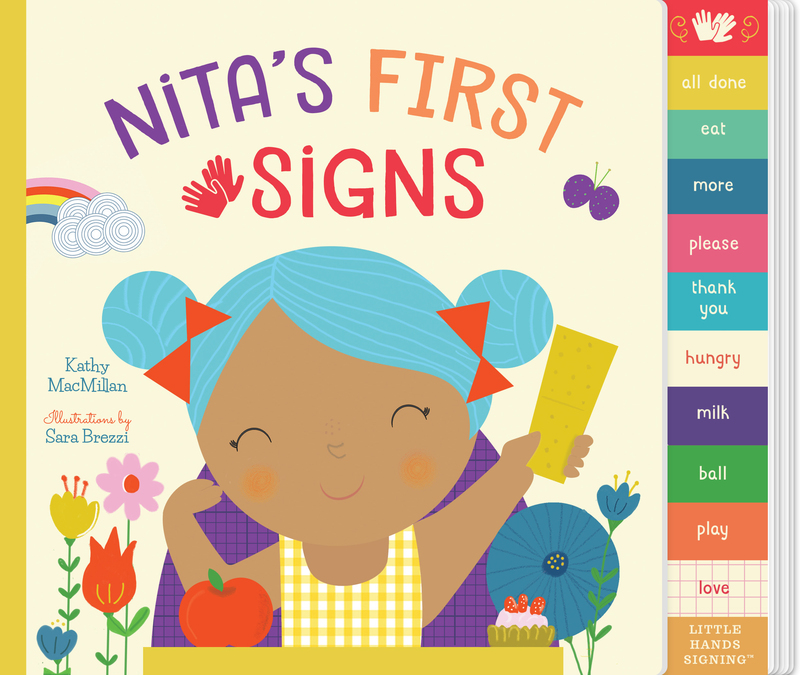 “Nita’s First Signs demonstrates the value and fun of learning sign language for ALL infants, toddlers children AND adults, regardless of whether they are Deaf or hearing or hard of hearing.” – Marlee Matlin, award-winning Deaf actress, author, and activist Find out more and order.